Well, I’ve been working on this year’s Christmas Putz Houses for three weekends now, determined to make 12 which will end up being two gifts of 6 this year. I even have nice gift boxes to put the entire little Putz Village in. But I have to finish them before the 19th because I have to give the gifts that weekend! I have four houses completely done! This includes the bases, glitter, accents, and decorations. That’s two of them pictured above. The church on the left is the same style I did last year. I think the nativity printed on the card makes for a perfect church so I made it again. Notice I even used it for the base and lined up the pattern. The open door on the front is even the door of the inn that is printed on the card. I used the Christmas Notebook template that I’ve mentioned previously, and instead of a chimney I used the bell tower template from Little Glitter Houses. I love the Christmas Notebook template because it’s smaller and helps you to utilize a greeting card much better. The church measures about four inches tall and three to four inches wide on its base. The house on the right is the Little Charmer pattern that I also did last year, but I moved the front alcove of the house more to the center. I found the little sledders on Etsy earlier this year in a packet of outdoor winter miniatures. The church is outlined in glitter glue, and the other house is flocked in snow glitter. 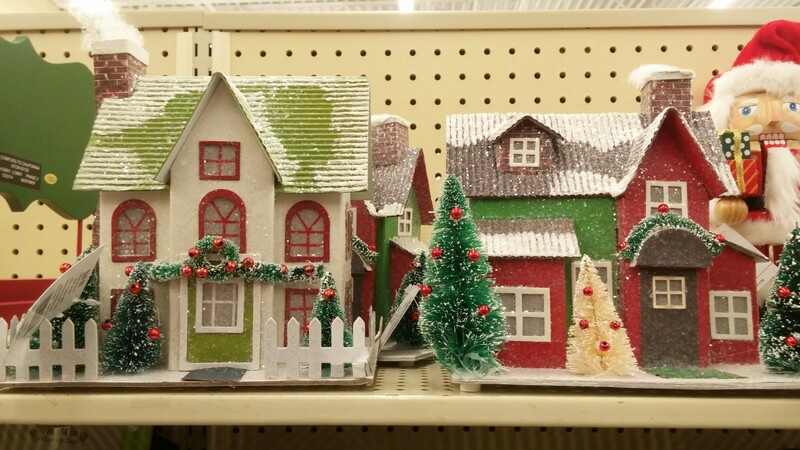 Traditional Putz Houses are usually painted a solid color and then covered entirely in matching glitter. I like putting the glitter on the house to look like snow in this case, and I piled it around the bottom of the house to cover any gaps between the house and the base. Two more of my finished houses are in the pic below which also use the Christmas Notebook template, but I made a different chimney for each. I think these two are fun because of the foil cards. They didn’t need much work after that, but I kept adding to them anyway. The red one has a swagged roof and is outlined with red glitter, and there is a miniature reindeer out front. The green house has a green button for a chimney top and its roof is outlined with a pipe cleaner. I also made the little front porch piece from scratch just to embellish it a bit. I found the reindeer in a small packet of six in the miniature section at Hobby Lobby, where I also picked up a pack of holiday pipe cleaners. Lesson learned! Pipe cleaners are not fun to work with. Yeah, they are pretty but they take forever to glue and sit. I had to hold each side for about ten minutes before the pipe cleaner would stay in place. I will use up the pipe cleaners, but probably won’t add them again. I’m tempted to add a tree to the outside of the green house. There’s room for it. What do you think? As I said, I made that trip to Hobby Lobby. I was on a mission for several things. First, I wanted to see if they were carrying those cardboard houses again that I mentioned in Part 6. Guess what? They had them! And I found out they carry them year round and in different sizes. The smallest one is about eight inches tall. The top also comes off so you can use it as a storage box for something I suppose. After seeing them in person, I wasn’t impressed so I opted not to buy one. The two larger sizes shown in the pic are obviously too big and wouldn’t fit in with the houses I make. The smaller one was fine, but would require lots of painting and embellishing. If you prefer that over building your own house, then you might like the little pre-made house. I can’t say I won’t eventually break down and buy one just to experiment with, especially since they carry them year round. But for now, I’m skipping it. Now, for those of you who want to buy houses already made, you’d also be in luck at Hobby Lobby! They had two for you to choose from over in their holiday decoration section which were each about eight to ten inches in size. 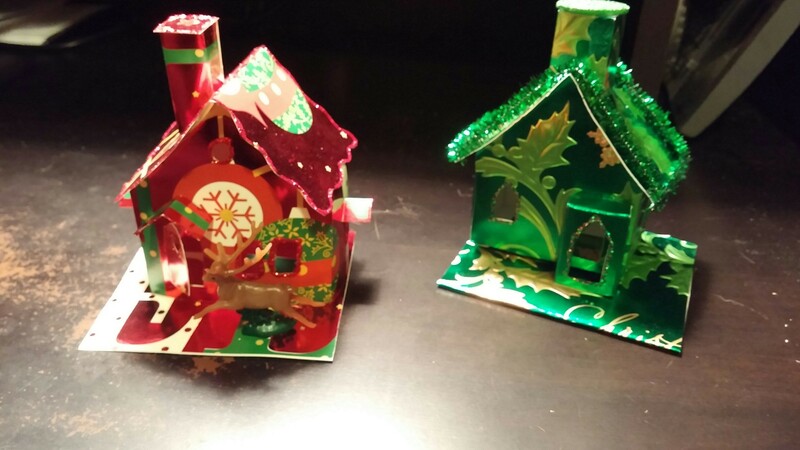 These were very traditional glitter houses – multiple colors of just glitter, windows, bases, trees and garland. Lots of depth and detail. They even had puffy smoke coming out of the chimneys. My favorite thing about these was the corrugated cardboard used on the roofs. I’ll definitely be keeping my eyes out for some of that to use on my own. Also, notice on the red house on the right that the alcoves/window seats have flat awnings on top. Making the top flat instead of arched would definitely save some time when adding that embellishment. And of course I like the smoke. I had been saving stuffing from my dogs’ toys to possibly use as snow around the houses, but now I have a better idea! 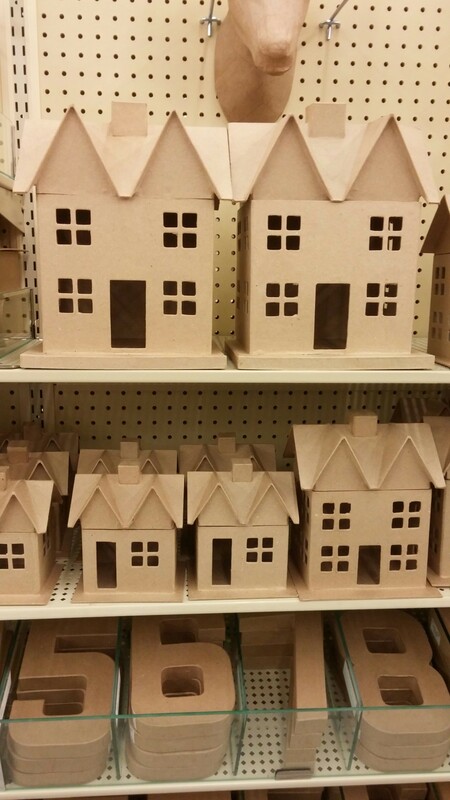 These houses were going for $24.99! Too much considering I can make my own, but they did give me some ideas! Next, I was on the hunt for miniatures. I found the reindeer in the back of the store where they had tiny packets of miniature furniture and trees and things, possibly for doll houses or railroad displays. I picked up the packet of six reindeer, and also got a pack of 5 larger bottle brush trees. 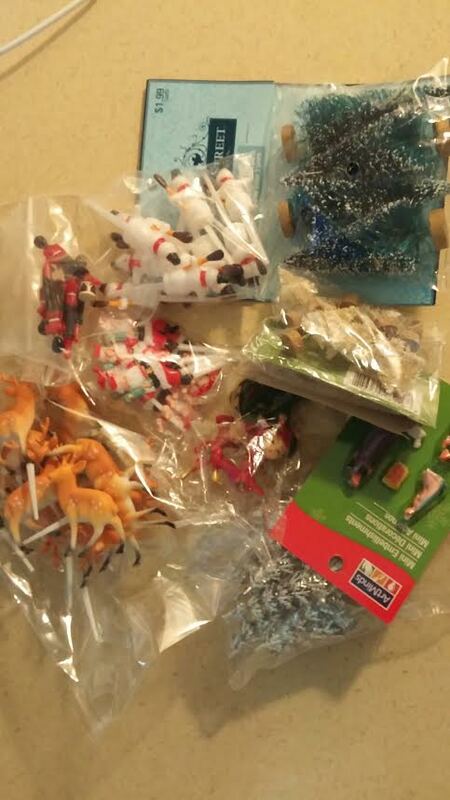 All Christmas items were 50% off that day, so the trees, reindeer, and pipe cleaners costs just under $3.00! Meanwhile, I also hit up Etsy and found some cupcake toppers that were reindeer, a bit larger than the ones I found at Hobby Lobby. And I found some more toppers that were silver Christmas trees, also a bit larger than my bottle brush trees I currently have. But these larger decorations will come in handy because the templates from Little Glitter Houses are a bit larger. I’ll have two of those to show you in the next post, including a new pattern that I just printed so that all of my houses don’t all look the same. I also recently purchased something that will make the bases easier to make as well, but I’ll save that for the next post too! A recent trip to Michael’s Craft store last week paid off. I found white bottle brush trees in two sizes and a miniature bear. I also found another miniature nativity. And thanks to installing the Etsy app on my phone, some more Christmas miniatures came up in my feed that I had to have. I bought some green and red pixie elves, some snowmen, more Santas, and some small marching band soldiers. The Santas and snowmen were cup cake toppers but it’s easy to remove the pick part. Go ahead and say it…I’ve gone miniature crazy. I’ll be spending this weekend building the rest of my houses and decorating them. I’ll have pics of all 12 houses to share in the next post, which will also probably be closing out my Putz House posts for the year. Christmas is fast approaching and I’m all putzed out!